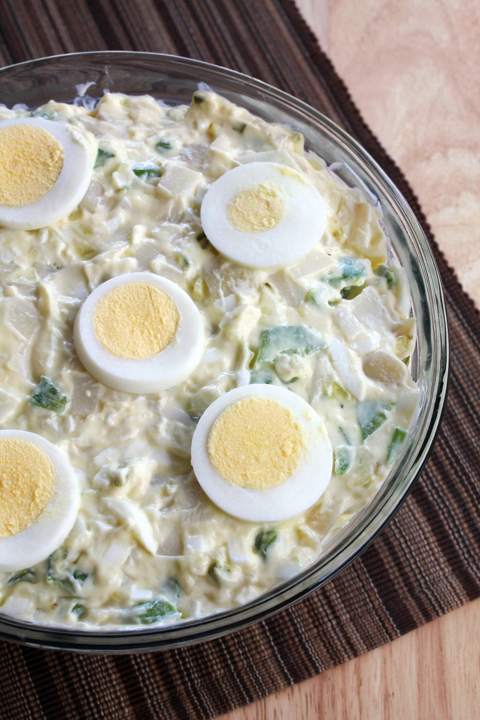 Dad’s Potato Salad is tender red potatoes, hard-boiled eggs, and bright green bell pepper get tossed together to create this delicious Potato Salad recipe that is perfect for Summer picnics and Memorial Day! I have a super talented food blogger guest posting for me today while I’m off gallivanting in the beautiful Caribbean for a vacation with Mr. Wishes. The awesome Erin from The Spiffy Cookie has an amazing blog that I am in love with. I knew we were going to be instant “bloggie” friends when I found out she is also from Rochester, NY! Head over to her blog and I guarantee you’ll want to follow her too! Her recipes (especially her desserts!) will not disappoint. She is a master in the kitchen and her creative recipes along with her beautiful photography are such a huge inspiration. I really admire her picture-taking skills and hope someday my photos will look half as good as hers! 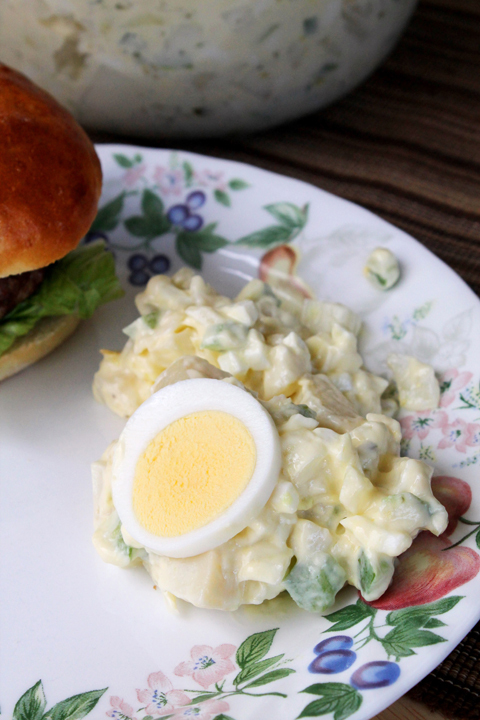 I’m super excited to share her and Dad’s Potato Salad with you all today! Hello Wishes and Dishes readers! My name is Erin and I blog over on The Spiffy Cookie. When Ashley told me she was looking for guest posters to share Memorial Day recipes I jumped on the opportunity. Not only is she from where I grew up and lived most of my life thus far, she also makes some delicious recipes (such as creamy bacon and cheese dip, peanut butter and jelly cookie cups & frosted animal sugar cookies) and it’s an honor to be among them on her blog today. When I think of Memorial weekend my mind immediately goes to the grill and the side-kicks that make it all come together. By side-kicks I am talking about the side dishes which pair so well with a juicy cheeseburger that your diet won’t stand a chance. My favorite accomplice is potato salad and like most families I think my dad’s is the best. When I was younger I had an aversion to crunchy things being in soft, creamy foods and would often request for my dad to set aside some of the potato salad without the onion and bell pepper – the two crunchy suspects. Yes, I was an incredibly picky eater as a child but thankfully have outgrown most of it as an adult. I finally understand that the onion and bell pepper not only add a little bit of crunch but a lot of flavor to this creamy potato salad. Thanks again, Erin, for your lovely guest post! Make sure to head on over to her blog and send her lots of love! Also check out my whole collection of pasta salad recipes! I love potato salad, but pasta salad has my heart. This Classic Italian Pasta Salad is so popular on my blog! You won’t even believe how easy it is to make. I think you will also like this BLT Red Potato Salad with Avocado from my friend Cheryl! Tender red potatoes, hard-boiled eggs, and bright green bell pepper get tossed together to create this delicious Potato Salad recipe that is perfect for Summer picnics! In a large pot, place the whole potatoes and eggs and cover with water. Bring to a boil and cook until toothpick will easily go through the potatoes. Drain and allow to cool until able to handle. Peel potatoes and eggs, then chop (reserving one egg, sliced for garnish). 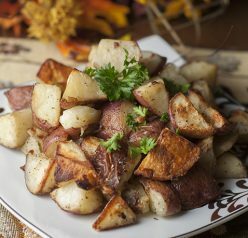 Place potatoes, eggs, and remaining ingredients into a large bowl and stir gently until thoroughly combined. Place in serving bowl, smooth out, and top with egg slices. Edited and republished on 4/11/18. Ashley hoping you are enjoying your trip – and thanks for guest hosting and Erin thanks for guest posting – I am not a reader of Erin blog -but that needs to change – this potato salad with green bell pepper sounds delicious! Enjoy your vacation – I’m sure it will be amazing! 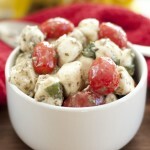 This potato salad looks so creamy and delicious! I love a combo of mayonnaise and sour cream in my potato salad! Thanks Christin! I also love the combo of the two. Sometimes I will substitute some of one or both with Greek yogurt for a slightly healthier version. 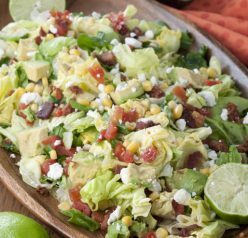 This looks like a great dish to bring to a Memorial Day picnic! I love the egg garnish on top. And I am so jealous that you live in the same city. I have yet to discover another blogger who lives anywhere near me, haha. Hope you’re having a great time on vacation Ashley!! It is definitely potato salad season, thanks Ashley! Thanks for having me! I hope your vacation is wonderful and happy anniversary! Such a terrific dish! Who doesn’t like potato salad? Great way to kick off the summer cookout season! I’ve used this recipe several times for family get together and everyone loves it! Thank you for sharing Ashley!